We finish our 2011 Phillies player prediction blogs with our 2011 Phillies starters prediction. You can also read our 2011 Phillies infield prediction blog and 2011 Phillies outfield and catcher prediction blog. Quick note: We left out the win/loss totals until the end since they are somewhat circumstantial and a bit more complicated. Roy Halladay did pretty darn well in his first year with the Phillies. Halladay ranked 1st in the NL in wins, innings, complete games, shutouts, and walks per nine innings (1.077). The Phillies ace of aces was also 2nd in WHIP, 2nd in strikeouts, and 3rd in ERA. Add to that a perfect game, a postseason no-hitter, and a Cy Young award, and the Phillies got an absolute steal at $20 million. There is no reason to believe that Halladay will be significantly better worse in 2011 for the Phillies. Last season was one the best of his career, as he set a career high in K/9 and tied career highs in complete games, shutouts, and BB/9. But Halladay wasn’t significantly better for the Phillies in 2011, which might be a good thing because it means that he has been consistently good rather than finding lightning in a bottle for a year. Seeing that Halladay has reached an apparent plateau in his career, he is more likely to pitch worse rather than better in 2011. Since we haven’t seen any decline yet, his drop off will be negligible at best. Expect to see a similar Doc Halladay in 2011. Feel free to check out Roy Halladay's 2010 Phillies report card blog and Halladay's career stats. Ahhh, Cliff Lee. Phillies fans got a taste of him in 2009 but now the Phils have Cliff Lee for at least five years. Will Lee live up to the incredible hype? Cliff Lee will improve upon the current trend and pitch even better than his last two seasons. Normally I let the statistical trends guide my predictions and this case the trend is "business as usual." But I have a feeling there is a big difference which the stats overlook. See, this will be Cliff Lee’s fifth team in 3 years (if you count the Phillies twice). Lee is a rhythm type of pitcher and it is hard to maintain a rhythm when you relocate every few months. It is mainly for that reason that I believe Cliff Lee will have his second best season in 2011 with the Phillies. He has pitched consistently well for three years, he finally got his free agent contract, and he can finally make a home here in Philadelphia. Feel free to check out Cliff Lee's career stats. Roy Oswalt pitched simply amazing for the Phillies last season, going 7-1 with a 1.74 ERA in 12 starts for the Phils. His 2011 season with the Phillies is not quite as promising. His ERA over the last three years is 41 points higher and he averaged 24 less innings, but his strikeouts per game are 64 points higher and his WHIP is 8 points lower. What does that say? I really don't know. Therefore, I may have to go with my gut on this one. On the negative side. Oswalt is an aging player who may be on his last two legs and most people would agree his is the week link of the four aces. I think Roy is well aware of all of this. Don't let his easy going country boy look fool you; this guy is a fierce competitor. My feeling is that Roy Oswalt feels he needs to prove something for the first time in a long time. I think the competitor will defeat the age with Roy Oswalt. He will pitch nearly as well as last year. Feel free to check out Roy Oswalt's 2010 Phillies report card blog and Oswalt's career stats. 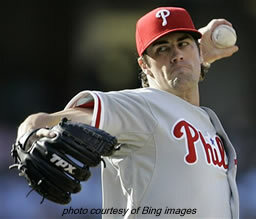 Cole Hamels is in my mind the most underrated Phillies player. As much as Phillies fans were rough on Hamels at the start of last season, his terrific 2010 campaign went largely unnoticed. That will change in 2011. Hamels had a bad season in 2009, but you might be surprised to find that from 2007-2010 (excluding 2009), Cole Hamels has a 3.17 ERA. And the fact that his ERA ranged from 3.39 to 3.06 tells me that is the "real" Hamels and not the one in 2009. Last year was one of the best for Hamels. He finished 2010 with a career best ERA (3.09) and had a career high 211 strikeouts. He also threw over 200 innings for the second time in his career (208.2). As good as those numbers sound, they get better when considering that Hamels had an ERA in April of 5.28. He was clearly still fine-tuning his cutter at the onset of the season. In the remaining five months, Cole compiled a dazzling 2.68 ERA. Feel free to check out Cole Hamels' 2010 Phillies report card blog and Hamels' career stats. And last but not least (actually it is least in this case) is Joe Blanton. Joe had a down year in 2010, but it wasn't too far off his career 4.30 ERA. The Phillies will be happy if Blanton can pitch close to his average and there is no reason to believe he can't. Blanton's ERA from year to year has gone up, down, up, down, etc. in each of his six full seasons. If the pattern continues, Blanton is in line for a better season in 2011. Blanton is no better or worse than a solid and consistent pitcher who never dazzles but always gives his team a chance. Pitching alongside the "Four Aces" puts Blanton in an interesting situation. He won't have much pressure since he will be matched up with opponents' fourth and fifth starters and should have decent run support. Holding the label of the "other guy" may give added motivation for Blanton to pitch well. Expect Blanton to fall right in line with his career averages. His ERA will be in the mid-four range, he will give the Phillies around 200 innings, and should have a decent win-loss record. Feel free to check out Joe Blanton's 2010 Phillies report card blog and Blanton's career stats. I went all math book on you to decide the starters' win totals. I first figured that the top four pitchers will each start 33 games and Blanton will start 30. Then I looked at the percentage of games in which each starter records a decision and multiplied it by their career winning percentages. The result was 17 wins for Halladay, 14 for Lee, 16 for Oswalt, 13 for Hamels, and 13 for Blanton. It's here: our final 2011 Phillies predictions! With our Phillies predictions blogs complete for the infield, outfield, and starters, we naturally finish with the overall 2011 Phillies predictions blog. To make this year's Phillies prediction more official, I tried to use as many statistics as possible. I therefore went position by position with the starting pitchers and position players to predict how each position will perform versus last season and how that will affect the overall team record. We begin with the starting pitching. The chart below shows the 2010 and 2011 Phillies rotations side by side. To start the season, last year's rotation consisted of Halladay, Hamels, Blanton, Moyer, and Kendrick. By the end of the season Roy Oswalt became the number 3 starter, Blanton moved to #4, and Kendrick stayed at #5. We split Blanton's numbers between the #3 and #4 starter positions since he spent roughly half the year at each position. To keep things simple, we also listed Hamels as the #2 starter in 2011 and Lee as the #4. The difference in wins is roughly the same, but there is a clear difference in ERA. Basing the ERA differential on 200 innings pitched for each starter, the Phillies starting staff will surrender 57 less runs than last season. Now let's look at the offense. According to these figures, the Phillies will score 65 less runs in 2011. Using last year's totals, this would drop the Phillies from 5th to 6th in the NL in hits, 5th to 12th in HR, and from 2nd to 9th in Runs Scored. Now we know the change in runs scored and runs allowed. But how does that equate to wins and losses? We simply apply the changes to last year's run differential. Take a look at the totals from the top five NL teams last season. The Phillies had the best record in the NL with 97 wins. When we put all the stats together, we found that the Phillies should score 65 less runs and surrender 57 fewer runs, giving them 707 runs scored and 583 runs given up in 2011, for a total differential of +124. That would put the 2011 Phillies 8 runs behind last year and right in the middle of the top two records from last year with 94.5 wins. We rank up (of course) for a prediction of 95 wins. The 2011 Phillies essentially removed Werth and Utley and added Cliff Lee, so it is a bit surprising that the results finished so high, but it looks about right. However, I believe Rollins will have a monster year and that Blanton and Hamels will pitch better this season. If that holds true, the Phillies will improve their run differential from last season. Charlie Manuel's Phillies teams have improved an average of around 2 games per season. 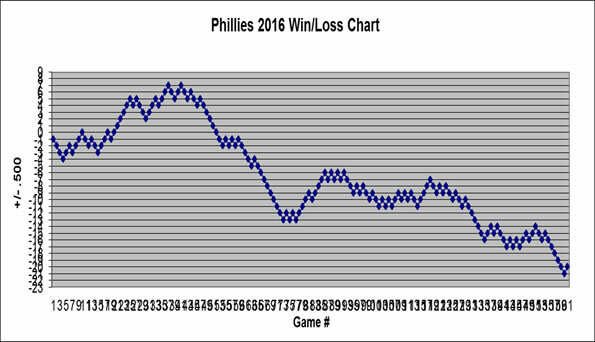 If that trend continues, the Phillies will get 99 wins. As much as I want to give the Phillies 100 wins, but why argue with the numbers? Our prediction: 99 wins. The Phillies will once again be crowned WORLD CHAMPIONS! It may seem like a long shot, but Hamels is ready to take his place as an elite pitcher. Now is the time Cole Hamels will claim the 2011 Cy Young award. The once prized Phillies prospect, Cole Hamels earned 2008 NLCS and World Series MVP honors. He nearly single-handedly brought a World Championship to Philadelphia. Yet Cole Hamels is considered to be the fourth best starter by his own Phillies team and he was already booed by his own fans after just his first start. His resume shows that aside from 2009 Hamels has been consistent and quite dominant. Cole compiled a combined 3.17 ERA in his last three seasons (excluding 2009). His ERA in those three seasons has been steady, ranging from 3.06 to 3.39. Those are remarkably consistent numbers. His 2009 season cannot be overlooked and may, in fact, be the turning point in his career. After getting caught up with the commitments associated with the "World Series circuit," Hamels was simply not prepared entering the 2009 season. The result was lower velocity and early season struggles from which he did not recover. I believe his struggles in 2009 make him a better pitcher today for two reasons. First, 2009 was the first time in his entire life that Hamels did not succeed and he had no clue how to handle the failure. He displayed terrible demeanor at times, showed outward frustration with his teammates' defensive mistakes, and had difficulty focusing in tough times. But with several months to reflect, Hamels came back in 2010 with a completely different outlook and managed his emotions well in one of his best seasons as a professional. Secondly, Hamels realized that he could not simply rely on a fastball, change up, and curveball. He therefore added a cutter in the winter prior to 2010. Cole struggled with his new pitch in April and had a 5.28 ERA. But once the light came on, Hamels was lights out with a 2.68 ERA in the final five months. But that was only a glimpse of things to come. In his final three months, Hamels had a 2.28 ERA, 1.04 WHIP, 9.33 K/9 and 0.61 BB/9. Just how good is that? Let's compare Cole's last three months to 2010 Cy Young winner Roy Halladay's full season numbers. Hamels' ERA was 16 points lower, his WHIP was the same, his K's/9 were 1.43 higher, and his walks/9 were 0.49 lower. Three months is not a full season, but 18 starts is a decent sample size that shows this guy's potential is sky high. 2011 will be the year Cole Hamels puts it all together. A 20.25 ERA in his first start certainly does not help his Cy Young hopes, but I stand by my prediction. Has anyone else noticed anything strange about the Phillies 10-6 record in 2011? It’s nothing mind-boggling like the best start in Phillies history or anything like that. Heck, you may not even find it interesting at all. But in addition to being the first back-to-back losses for the Phillies in 2011, Tuesday ended another interesting steak: it was the first time all season the Phillies lost game two or game three of a series. Until last night, the Phils had a perfect 9-0 record in games 2 and 3 combined and a 1-5 record in game ones. After sweeping the Astros in the opening series, that means the Phillies have lost game one in every single series. Yet this Brewers series will be the first series lost out of five series. Many claim the first game is the most important game of the series. Maybe the Phillies disagree. Don’t forget this win, folks. At the end of the Phillies 2011 season, I hope this blog triggers your memory of the Phillies victory yesterday afternoon at Citizens Bank Park over the Milwaukee Brewers. In the grand scheme of things, April 20th may be just another game in the 2011 Phillies schedule. Just another of hopefully close to 100 Phillies wins in 2011. But it might be something more. To think of it in another context, what if the Phillies lost the game? Entering the fifth inning, the Phillies were staring down a no-hitter and mustered only 2 hits in a total of 13 innings against two very average pitchers. We would be looking at a possible sweep by the visitors and two straight losses with Cliff Lee and Roy Halladay on the mound. Oh, and the lack of pop. The Phillies would need to field question after question about their weak offense before jumping on a 3,000 mile flight. Ugh. But that didn't happen. A three-run bomb from Polanco and a solo jack by Victorino put the Phillies on top for good. Now the comments turn to the resiliency of the Phils, their togetherness as a team, and their ability to win close games. It was a momentum shift similar to that in a playoff Flyers game. We can easily look back to the walk-off wins, the one-hitters, and the 15-0 blowouts as the turning points, but maybe it is the games in between that define a baseball season. Remember whichever game you want, but I will remember this one. Where do the Phillies rank in the NL East? How do the Phillies match up against their NL East opponents? Most of us expect the Phillies to win the NL East in 2011, but are the Phillies the best on paper? I thought it might be fun to find a mathematical way to rank each of the NL East teams. The plan was to provide this blog on opening day, but better late than never. As with most prediction blogs, this was not a simple endeavor by any means. There is a bit too much involved to fit into one article, so in this blog I will explain the method used and provide the overall team results. We will get into the specific player ratings and team-by-team comparisons in the next week or so. First, let’s quickly go over the general rating system and methodology. I compared each NL East team position by position. Players were broken down into three groups (hitting, starting pitching, and relief pitching) and given a score in numerous categories based on a 5 point scale (1 being the worst and 5 being the best). For all rookies, I took their 2010 minor league stats and projected those totals to the major league level. Now we can take a look at the rankings for all three groups. Hitters were graded on Batting Average, HR, RBI, Slugging Percentage, On-base Percentage, and Runs using the 5 point scale previously mentioned. They were given a 3 point scale for Stolen Bases since a huge majority of players steal less than 10 bases in a season. Each player received a score out of 23 total points and scores from each nine positions were combined for a team total. The goal here was to balance the ability to get on base with the ability to knock in runs. When it comes to pitching, all that really matters is how many guys you put on base and how many of them score. Therefore, pitchers received a grade in two categories: ERA and WHIP (walks + hits per inning pitched). Each player received a score out of 10 total points and scores from all starters were combined for a team total. Since not all teams were graded on five pitchers (teams that haven’t nailed down a rotation were graded on six pitchers), the final results for pitching are an average of their scores rather than a straight total. Relief pitchers were also graded on ERA and WHIP and given a score out of 10 points. However, since ERA's for the top relievers is way lower than for starters, the scale was slightly different. We can’t simply take the combined totals to determine a winner since each category was based on a different scale. To even the scales, I simply took the totals points scored in a single category and divided it by the total possible points to get a percentage. But we can’t give the same weight to the starters and relievers, can we? Since starters pitch roughly 6 innings per game compared to 3 for the relievers, the starters should receive twice as much weight. I therefore graded on a 100 point scale, giving 40 points to hitting, 40 points to starting pitching, and 20 points to relief pitching. At this point (and if I haven’t lost you yet – congratulations) I simply multiplied the percentage by the number of points for the final scores. For example, the Phillies hitting scored 136 points out of 264 (52%). I multiplied the percentage (.52) times 40 points for a total of 20.6 points. I then added the three totals together for a complete score out of 100. Juan Samuel has made one great decision after another as third base coach for the Phillies. In fact, I would venture to say that Juan Samuel has made the right decision in every single situation. Shane Victorino’s inside the park home run this week was yet another example. Third base coaches are kinda like umpires: if you don’t think about them, they are probably doing a good job. Steve Smith was awful and got crucified for his work, yet Sam Perlozzo did a great job and was practically ignored. Then I guess it is a good thing that nobody seems to have noticed Juan Samuel standing in the third base box this year. Hopefully this blog can help change that. The 50-year-old Dominican Republic native began his 16-year career with the Phillies from 1983-1989. The Phillies traded him to the Mets in 1989 for Lenny Dykstra and Roger McDowell. He then proceeded to play for six more teams in both leagues, including two stints with the Royals. The three-time all-star was a career .259 hitter with 161 home runs, 703 RBIs, and 396 steals in 1720 games. Samuel also found his way into the record books. He set the MLB record in his rookie season with 72 stolen bases (later broken by Vince Coleman). In 1987, he became the first player to reach double digits in doubles, triples, home runs, and stolen bases in each of his first four seasons. Samuel also holds the MLB record for most at-bats by a right-handed hitter in one season (701) and he tied the record for consecutive strikeout titles (4). When his playing days were finished, Samuel coached 1st and 3rd base for the Detroit Tigers from 1999-2005, managed the Double-A Binghamton Mets for the 2006 season, and was the 3rd base coach for the Baltimore Orioles from 2006-2010. So, what makes Juan Samuel a great third base coach? A good third base coach is one that takes chances, but good chances. The goal is not to be perfect, but to maximize the potential runs available. Play too conservatively and you leave too many opportunities on the table. Play too aggressively and you can ruin momentum and the chance to win games. Juan Samuel has used the perfect mixture so far with the Phils. Can you remember any base runners thrown out by a mile or any runners standing on third that should have scored? 1. Jimmy Rollins singled with Halladay on second and Samuel held him at third. Halladay would have very likely scored easily, but Samuel realized he simply could not risk injuring Halladay on a play at the plate. 2. Shane Victorino’s inside the park home run. Samuel certainly had reasons to hold him at third. First, there were no outs. Secondly, Samuel had no idea what energy Victorino had left as he rounded third, since that is obviously a play they don’t practice. Since it would have taken a perfect throw to beat him, it was worth the risk and sure did create enthusiasm when Victorino scored.